A well-executed movie night in Fairfield County, which includes eating out before or after the flick, usually requires some skill. You have to factor in the length of the movie and the distance to the restaurant and hope that there isn’t any traffic along Post Road so you don’t miss the coming attractions or your reservation. As soup is the first thing listed on the menu, we tried two different types: Avgolemono, your classic chicken and lemon soup, and Sorva, a barley yogurt soup that is a specialty of the Pontics. Not bad soups by any means, but not top of the “love it” list in my book compared to everything else we ate. It was also 90 degrees outside so maybe subconsciously, hot, thick soup never had a chance to shine. Perhaps I will revisit that once the Fall arrives. We had to have the Country Greek Salad..As they say, “When in Rome” , er, or Greece in this case.” Fresh, tasty, crunchy. Tomatoes, cucumbers, red onion, pepperoncini? ?, and feta tasted divine and were evenly and lovingly coated with their seasonings, which were right on target! The tomatoes, which can make or break the deal, were juicy as well as vibrant in color, which as we all know, is important for first impressions in a Greek Salad. I could easily eat this for lunch several times a week. 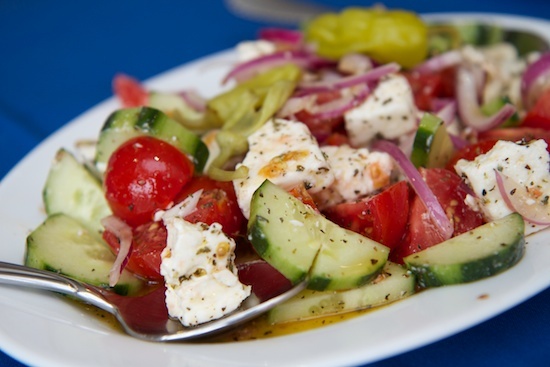 In honor of the Olympics events and their Greek roots, I have scored the Greek Salad a 9 ½. There are other salads to choose from including a beet salad, cucumber salad and pickled veggie salad. I’m not much of a red meat eater these days, but I found my fork was gravitating toward the Beeftkia that we ordered, more than enough times. 3 nicely sized patties were in one order. 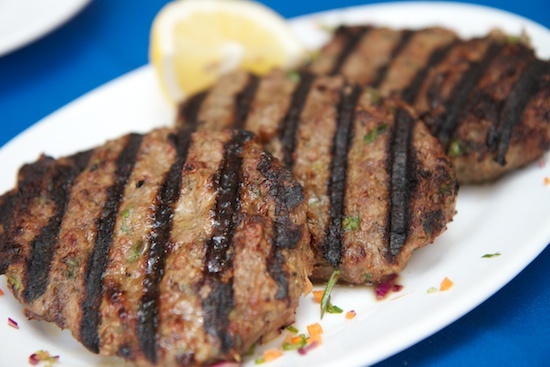 These Greek, seasoned beef patties were as light as a feather and super moist..a combination in a meat patty that is hard to perfect. Fresh, bright green parsley was generously mixed in and the spices were just right and did not overpower the meat. Again, those gorgeous signature grill marks..Theodore, what’s your secret? 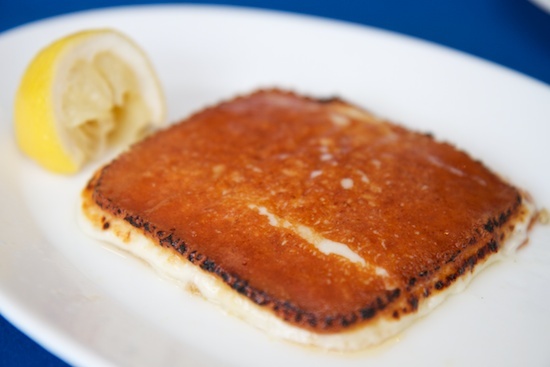 And speaking of secrets, one lays in that of the seasoning of the pan fried “Kalamari’s commendable breading. I asked Anna what the seasonings were as I noticed there was a nice little kick of flavor. Not a spicy kick, but kick as in instant taste bud awakening in each bite. I was told, “It’s a secret.” Well Anna, you have 7 kids, you should know that keeping secrets isn’t nice! I’m determined to figure it out..I’ll keep you posted if I have a taste bud breakthrough. We had to try some souvlaki and gyro which were both moist and flavorful. They have chicken and pork . If you’ve dragged your picky eater kids with you, this is your go-to item. 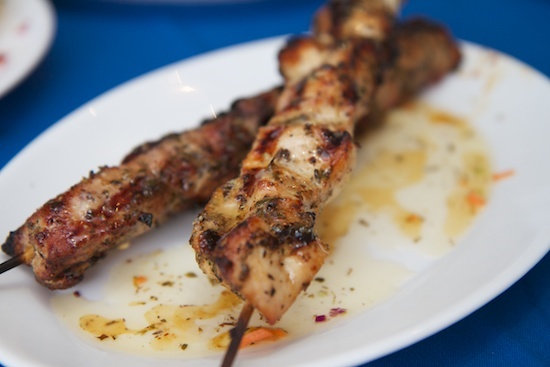 You can order the souvlaki or gyro a la carte, as a platter, or sandwich with all the Greek fixins’. There are a la carte dishes as well. 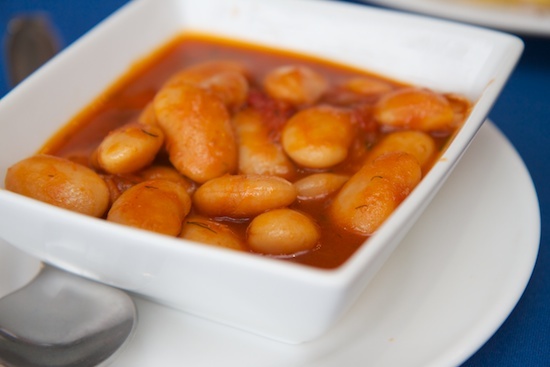 We tried the Gigantes, baked giant white beans in a tomato sauce with accents of fresh dill that I really enjoyed. I have made a mental note to myself to try the stuffed grape leaves next time as well as the spicy mashed feta spread. Also on the menu are all the well known dips one would expect to find here: Eggplant garlic spread, tzatziki, a garlic potato puree ( is this a nicer way to say mashies? ), and what sounds very sumptuous, a homemade caviar spread. If your mouth waters when you read it on the menu, it must be tried, so I will have to go back, with or without seeing a movie next door! Before I leave you with all this to digest, let’s talk about Ted’s rice pudding. We were all replete with Pontus’ home cooking, when one of the gals I lunched with started talking about how insane this rice pudding was. Mind you, two among us, had big dinners planned later in the evening and I had skipped my workout this morning so there was a bit of deliberation before deciding. As stomache expansion is part of the job and in the spirit of the Olympic eating event taking place right then and there, we ordered it. (We were both spectators and competitors so we could only judge ourselves!) Nicely chilled, it was decadently rich and creamy like a good rice pudding should be and the sweet flavor notes were beyond delish. Lots of fresh cinnamon on top and folks, we’ve got a winner. Yes, I’m raving! My kids would go ga-ga over this pudding!